New parents may feel a myriad of emotions upon returning to work after their parental leave, and it is difficult to know how to handle those feelings—not to mention figuring out how to juggle your new normal. Vault caught up with Lori Mihalich-Levin—mom, author, lawyer, and work/life connoisseur—to find out more about her program Mindful Return and advice on heading back to work after baby. Vault: What inspired you to launch Mindful Return, and can you share a bit about the resource? Lori: My own experience navigating the return to work after two children prompted me to create the Mindful Return program. I saw resources out there for everything baby related—from nursing and pumping resources, to how to make a birth plan, to how to puree baby food. But I couldn’t find anything on how to navigate your own transition back to work that helped you to feel (1) as though you weren’t going off the rails, and (2) that you hadn’t just wrecked your career. The resource itself is a four-week online program that people from all different professions, industries, and career paths take. The course helps new parents both learn strategies for returning to work and also connects them with other new parents who are in the exact position they are in. There’s a version of the program for new moms, a version for new dads, and a version for moms with special needs children. Forty-four employers currently offer Mindful Return as a parental leave benefit, so you may be able to register through your employer. You can also simply sign up for it yourself. In terms of timing, you can take the course from anywhere, at any time of day or night. All of the lessons are text-based and blog-post length, so they’re not overwhelming. There is also a post-course alumnae group, so you can be connected to the hundreds of other moms who have gone through the program in the past. Vault: Your book Back to Work After Baby: How to Plan and Navigate a Mindful Return from Maternity Leave shares advice on returning to work after you have had a baby. What are the three most important takeaways that you hope new parents will gain from reading this book? Lori: First, it’s okay to want to go back to work, and it’s okay to feel conflicted. You’re totally not alone in feeling however you feel about returning. Second, I think working parents make amazing leaders. I am a firm believer that parenthood actually gives you so many skills that are indeed applicable in the workplace and make you better at your job. You didn’t lose your old skills when you become a parent; you actually gained new skills and refined your old ones. And finally, finding even a few minutes a day for self-care is absolutely critical. Especially when the babies are tiny and you have so little margin in your day for yourself, taking just a couple of minutes to be present, and breathe, pause, and reflect can really change the way you think about your day. One example from my own life is that for many years,when I was commuting to my office, I would incorporate this daily pause into my commute. I would take the metro, and then I had a ten minute walk from the metro to my office. During that walk, I’d stop at a park bench or (on bad weather days) in hotel lobby, turn on the Insight Timer app, and breathe,meditate, and appreciate being alone where no one knew where I was. Even just a tiny pause each day, can reorient you and get your head in a better place both at work and at home. Vault: What advice do you have for new parents who are struggling over the decision to return to work? Lori: This question always brings me back to the idea of trusting what is right for you. Two mantras I repeat often are “comparison is the thief of joy” and “you do you.” If you have a desire to have a professional identity, pursue that. It makes you only a better parent that you are getting that professional need satisfied. Second important point: you are not abandoning your baby. You are still raising your child, and people have relied on villages, supports, and so-called “alloparents” for pretty much all of human history. It’s normal to be supported by a village. The last thing I’d note is that the data shows we tend to grossly overestimate how much time we think so-called “stay-at-home moms” actually spend interacting with their kids. 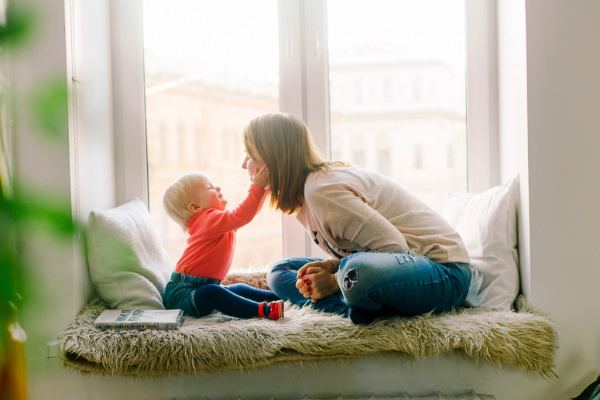 Time study research shows that working moms actually spend approximately the same amount of time interacting with their kids as stay at home moms. (Read Laura Vanderkam’s book, 168 Hours: You Have More Time Than You Think for more on this topic.) You’re not being any less of a committed parent by going back to work. There are other things that might go—indeed, your house might not be pristine—but you’ll still interact with your children just as much. Vault: What kinds of perks or benefits should jobseekers look for when considering a new employer in terms of parental support? Lori: There are a few to look out for. First, a backup childcare benefit is a huge one. I had no idea for the first 18 months I was at my current employer that there was a backup care benefit. Once I discovered that it was available, it revolutionized my life. Another question I’d ask is whether the employer has any sort of working parent community within the organization. Breastfeeding and lactation rooms are important resources for working moms, too. Even for smaller employers, it’s important to ask if there is a designated place where you’d be able to pump. For people thinking about having families, does the employer offer IVF benefits? It’s expensive, and employers that offer this benefit really take the burden off the employee. I’d also investigate whether the employer has good paid parental leave policies. Are they gender neutral, or do they still include a so-called “primary caregiver” distinction? How many weeks of paid leave is provided? Finally, I’d ask whether the employer offers any type of parental leave transition resources like the Mindful Return program and other employee new parent mentoring programs. Becoming a working parent is a major life change, and it’s always reassuring to know the employer will have your back as you become a parent. Vault: Mindful Return offers an E-course for new working dads. Fathers don’t always receive the support they need to take time for their children. Why is this so important, especially in fields like law, banking, and consulting? Lori: It was actually the employers I work with who requested the dad version of the Mindful Return program, because they wanted to be able to offer a gender-neutral benefit to their new parents. 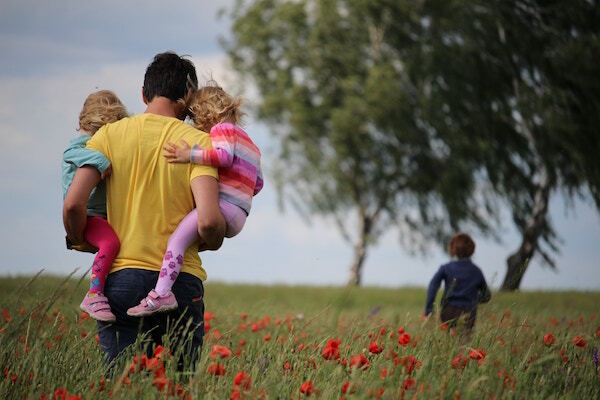 Many of their younger millennial dads were taking longer parental leaves and really wanted to be integrally involved in their children’s lives. I had always intended to launch a program for both parents. I just started with the mom version first (for obvious bandwidth reasons!). The dad version has similar content to the version for moms. But it also a has a separate week that a dad can take at any point after he finds out he is going to become a dad, that helps him decide how much time to take off, how to approach the leave conversation, and how to plan for it with his team. The goal for this part of the program is to normalize the conversation around the dad’s taking time off. That is where I think a lot of companies are struggling culturally. They may offer gender-neutral paid leave, but many of the dads only take a week, while the moms take the entire leave. There is definitely a desire among working dads today to have these conversations around working parenthood, but not a lot of places for them to have it. Vault: I noticed you recently launched a resource for parents of children with special needs. Can you share more about this new offering? Lori: I co-launched this new version of Mindful Return with a mom named Mia Durairaj who has twin toddlers who both have really serious medical needs. They were born three months early, and I realized by talking to Mia that moms with special needs babies face a lot of unique issues that may not make them feel comfortable in the program with moms of typically developing children. Their circumstances are often unique. A lot of times they drop out of the work force or have to change their schedules dramatically. And there were no resources out there to support the professional aspirations of moms with special needs babies and toddlers. We created what Mia wished she had had when she was going through that process. The program is taught in the same format as the other versions of the program (lessons, community, alumnae group). It’s meant to be a safe place for moms dealing with issues like babies in the NICU or children with autism, Down syndrome, or other medical and developmental conditions. Vault: You are a partner at a law firm, so you’ve experienced first-hand what it is like to juggle firm life and kids. What advice do you have for lawyers in particular who are learning how to balance their careers and parenthood? Lori: Shortly after my oldest son turned 7, he asked if boys were allowed to be lawyers when they grew up. I had to laugh, because the truth is, in his world there are so many women who are lawyers! This prompted me to reply, “Of course, sweetie—you can be anything when you grow up,” but his question was also so amazing to me, because there was a time in the not-so-distant past, when there were no women lawyers. My point is, you are a really important role model. In terms of advice, I’d say, find other lawyer parents. Talk to them. Get help. It’s okay to hire someone to come to your house and be an extra set of adult hands at bedtime, if you or your partner is out of town. Know that there are places where flexibility is supported. And use your “split shift” to your advantage professionally. After the babies go to bed at a relatively early hour, there’s time to plunge back into projects. And finally, communicate about your availability based on your own comfort level. I have found that clients expect you to be busy. Yes, they want immediate answers like everyone else, but if you tell them, “I’m not free at 9 a.m. tomorrow, but I can talk to you at 1 p.m.,” you don’t need to tell them that you’re at your child’s Kindergarten holiday party at 9 a.m. You can communicate appropriately while maintaining flexibility and responsiveness. Personally, I go completely offline from 5-8 p.m. This screen-free period is a sanity booster for me, and my clients know to text or call if they have a problem. Barring emergencies, everything else can wait. More About Lori: Lori Mihalich-Levin is the founder of Mindful Return, author of Back to Work After Baby: How to Plan and Navigate a Mindful Return from Maternity Leave, and creator of the Mindful Return Maternity Leave E-Course. She is also a partner in the health care practice at Dentons US LLP. 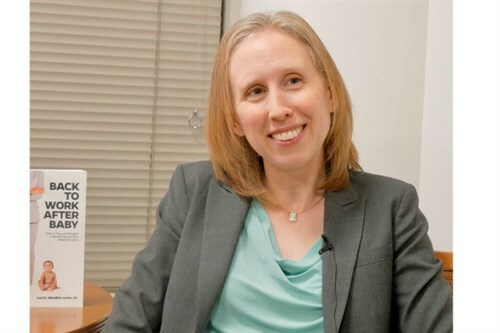 Lori holds a law degree from the Georgetown University Law Center and completed her undergraduate studies at Princeton University’s Woodrow Wilson School of Public and International Affairs.